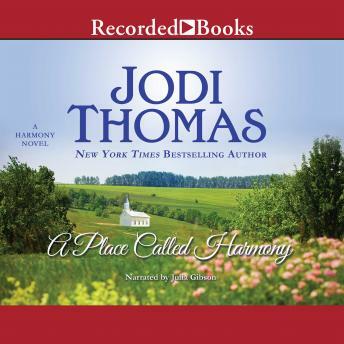 New York Times bestselling author Jodi Thomas has captivated America with her novels set in the small town of Harmony, Texas. Now she tells the story of the three hard-luck men who first settled the town, a place where last chances and long-awaited dreams collide. Desperate to escape his overbearing father, Patrick McAllen disappears with his bride, heading north to build a new town-discovering strength, honor and true love along the way. After drinking away the grief from his family's death, Clint Truman avoids jail by taking a job in North Texas and settling down with a woman he vows to protect but never love-until her quiet compassion slowly breaks his hardened heart wide open. All Gillian Matheson has ever known is Army life, leaving his true love to be a part-time spouse. But when a wounded Gillian returns home to find her desperately fighting to save their marriage, he's determined to become the husband she deserves. Amidst storms, outlaws, and unwelcome relatives, the three couples band together to build a town-and form a bond that breathes life into the place that will forever be called Harmony.